Learn how to create yarns that shift from one color into another or from a light hue to a super saturated one. 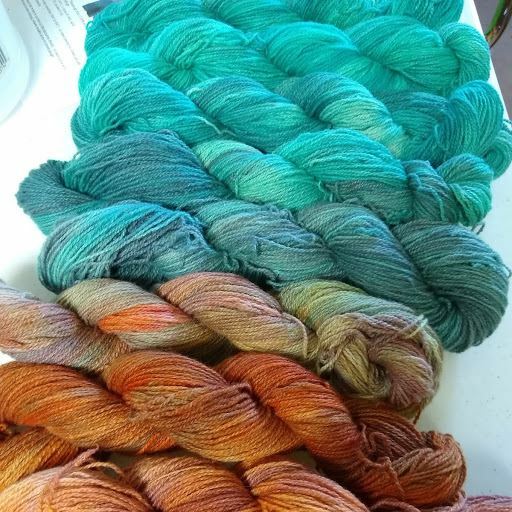 We'll help you mix dyes and show you how to add speckles to create skeins of yarn that fade gradually from one to the next. Throughout the afternoon there will be some down time while the yarn is steaming, cooling, drying, etc. so please bring your WIPs to work on and any finished projects for show and tell. Knitters and crocheters are encouraged to bring patterns along to reference or discuss and weavers should come prepared to design your own custom piece. To allow for individual guidance, only 8 spaces are available.